When someone says "western whiskey" many of us automatically think of San Francisco. 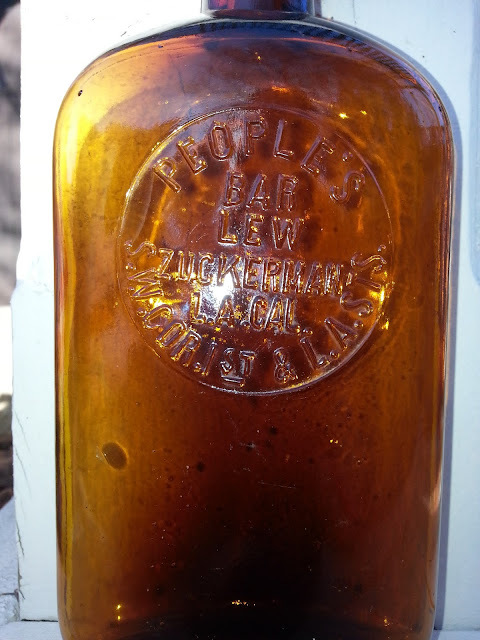 While it's true that the bulk of the earlier bottles dating pre-1900 originated in, and are embossed, San Francisco (or S.F. ), Los Angeles had it's share of saloons and liquor dealers as well. For whatever reason though, the So. Cal. 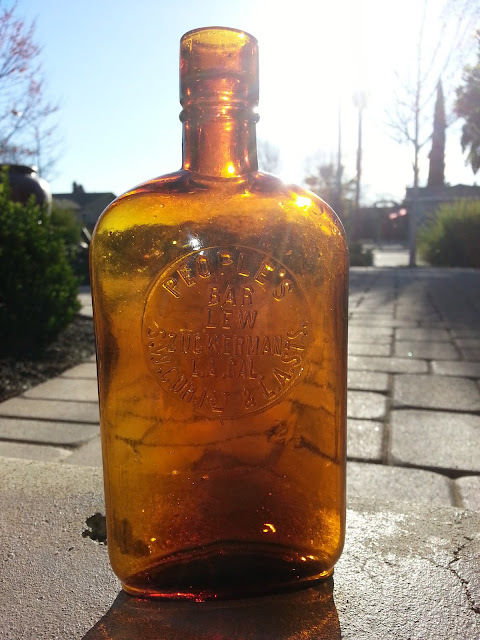 dealers generally preferred paper labels, as opposed to embossed private mold flasks. Why? Cost was probably the most important factor. Why go to the expense of having a private mold cut when, for a couple of bucks, you could have hundreds of fancy colored labels printed which you could slap on a flask that you could purchase for next to nothing from the used bottle and rag man? Another factor is the apparently transient nature of Los Angeles saloons. From the research I've done on the minimal number of "new" embossed flasks that have popped up over the past few years, the life expectancy of a post turn of the century So. Cal. saloon was a scant few years at best. By the time that LA really hits it's stride, in the teens, the temperance movement was in full stride and the Volstead Act was already looming on the horizon. If one was to make a go of it in the saloon trade, they best figure on getting in and getting out in a hurry, while the getting was good. Last week another new example popped up. I'd never heard of it, let alone seen or owned one, and was anxious to track down the history of it. "PEOPLE'S BAR / LEW ZUCKERMAN / L.A. CAL / S.W. COR. 1ST & L.A.STS"
Henry Lew Zuckerman was born in Hungary in 1885 and came to the United States in 1900 at the age of 15, first to Brooklyn where he worked as a market clerk (for $4 a month), cigar maker and tailor, and then to Iowa, South Dakota and, in 1907, to Los Angeles. His first job here was as a tailor on Hill Street near the site of the present Biltmore Hotel and then as a cleaner and presser again on Hill Street. A laundry wagon driver named Ben Weingart, who went on to become the multimillionaire financier and philanthropist who founded the city of Lakewood, encouraged Zuckerman to take in laundry as well and the two partners prospered. He went variously by either Henry L. or H. Lew - Zuckerman. He was married to Sadie (also born 1885) in 1909, prior to the listing for his first saloon. His first saloon was located at the Southwest corner of 1ST & L.A. Streets in Los Angeles. His first born, Ted, made his appearance on Feb. 4, 1910. Next came son #2, Marvin, in 1917. H. L. Zuckerman died at 102 years of age in 1987. Sadie preceded him in death, at age 98, in 1983. Zuckerman established the 136 E. 1st St. address in 1913; which is the first year that the saloon appeared in any city directory. The 1914 directory showed the same business address, and added a notation to his home address. The saloons location had remained fixed at 136 E. 1st St. from the 1913 through the 1915 directories. See comparative locations of the two saloons. The locations were roughly a mile, and many blocks, apart. Why the move? The 7th St. & Central location appears to be teens in construction style, and looks to be in a seedy part of town now. The location is now a market shown on the far right in the above photo. The second photo shows the intersection of 7th & Central. The 1st St. and Los Angeles location looks to be urban renewal. I found additional info in the general (white pages) 1916 city directory listing. Note the same residence address. Continued searches showed that the Central Ave. address remained open only until 1916 and disappeared before the 1917 directory was published. A thorough search of newspapers revealed nothing in the way of advertising. My guess is that he jumped in with both feet and much fanfare, only to realize that eeking out a living as a barkeep / saloon owner wasn't all it was cracked up to be and decided to cut his losses while he could with Prohibition looming on the horizon. I have no idea for the reasons behind the move though. Lower overhead? Perhaps a fire? Those interested in learning a bit more about H. L. Zuckerman can click on the following link. Although there are some slight inaccuracies present, based on the facts contained in the LA directories, it helps to fill in the blanks on his accomplishments during a 100 plus year lifespan. He was a fascinating individual.